Elise Mertens was crowned the singles and doubles champion at the inaugural Samsung Open after defeating Aryna Sabalenka in both finals, triumphing in straight sets on both occasions. Elise Mertens capped off a rainy week at the Samsung Open perfectly with a terrific performance against young powerful starlet Aryna Sabalenka, triumphing 7-5, 6-2 in the final, one of the few uninterrupted matches throughout the tournament. It was an unbelievable run for the Belgian, who stormed through a tricky draw having gotten past defending champion Marketa Vondrousova 7-5 in the third during the second round of play, before retrieving from a 1-4 deficit in the deciding set against Mona Barthel in the last eight. Furthermore, she was on the brink of defeat against qualifier Vera Lapko in the semifinals having been just five points away from defeat, but produced an incredible comeback to triumph in her third consecutive three-setter. Whereas, this was Sabalenka’s first-ever professional WTA tournament on clay but managed to achieve a decent result having not lost a set since the first round. The pair also faced off in the doubles final, with Mertens prevailing once more to win her ninth match in 72 hours. After an edgy start to the highly-anticipated final, both players were struggling to find their feet as they looked extremely bothered by the tough conditions and had problems maintaining their high level especially when they played three matches the day before, including doubles. At one point in time, Sabalenka had a run of eight consecutive points with her aggressive and ruthless hitting, stealing three games on the trot to take a 4-3 lead. 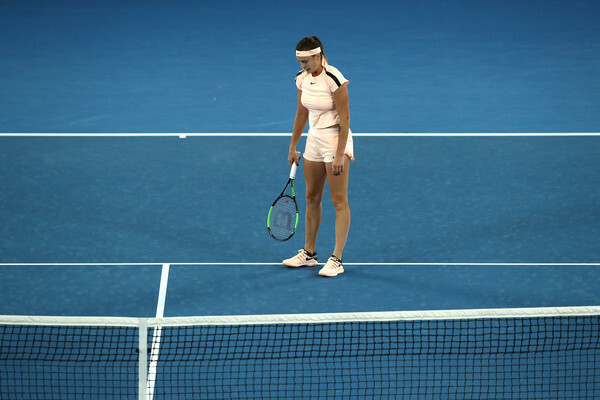 Consistency continued to be Sabalenka’s biggest enemy as she produced an abundance of unforced errors on multiple occasions, with a double-fault gifting Mertens a break point in the ninth game. However, the Belarusian youngster finally had something to celebrate with some world-class and unstoppable tennis, fending off multiple break points to hold for 5-4. However, Mertens’ excellent counterpunching style was just too good, taking advantage of her opponent’s slew of unforced errors and ultimately closing out the opening set 7-5 after just 47 minutes of play. With all the momentum running in Mertens, things looked like they were going downfall for Sabalenka. She lost the rhythm on her shots and her errors started to cause her to get frustrated with herself. Yet another aggressive shot backfired for the 19-year-old as the Belarusian was broken in her opening service game of the second set. Mertens tightly held onto her lead and never seemed to let loose, remaining solid on her serves which prevented Sabalenka from making any breakthrough. The perfect chance came for the Belgian to extend her lead in the fifth game, where she earned triple break points as Sabalenka completely lost the plot on her serve. Nonetheless, consecutive winners from Sabalenka reflected her fearless mentality and she kept herself in contention with a spirited service hold which showed her nerves of steel at the sight of defeat. Rattling off 12 of the last 16 points in the encounter, the second set could be considered as a one-way traffic for the outstanding Mertens who seemed flawless after getting the flow on her shots. The match concluded with Sabalenka hitting her 35th unforced error of the day, while Mertens hit just seven errors alongside nine winners throughout the 84-minute affair.